Summer recipes should all be like this: cold, crispy, and peach-filled. 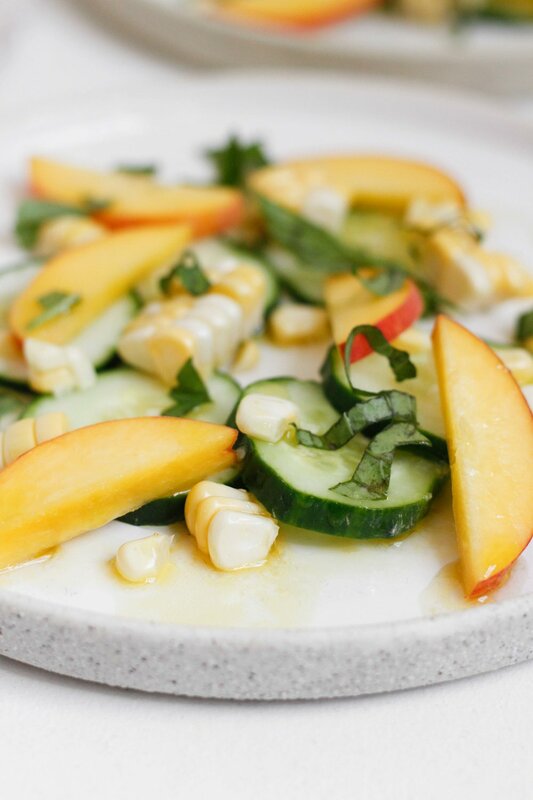 All you need to make is a quick whisk-friendly vinaigrette and slice some corn, cucumbers, and peaches. The corn in this recipe isn't cooked, instead it's eaten raw. Don't worry, you can enjoy corn raw! It's crunchier uncooked anyways. Eat up. Start by preparing the produce: slice the cucumber, pit and slice the peach, and cut the kennels away from the cob of the corn.Make the vinaigrette by whisking together the olive oil, sesame oil, honey, and ginger. Squeeze in the lime juice and give the vinaigrette another whisk.Gently toss the vinaigrette together with the cucumber, peach, and corn. Top with roughly torn basil leaves. Enjoy chilled or room temperature.